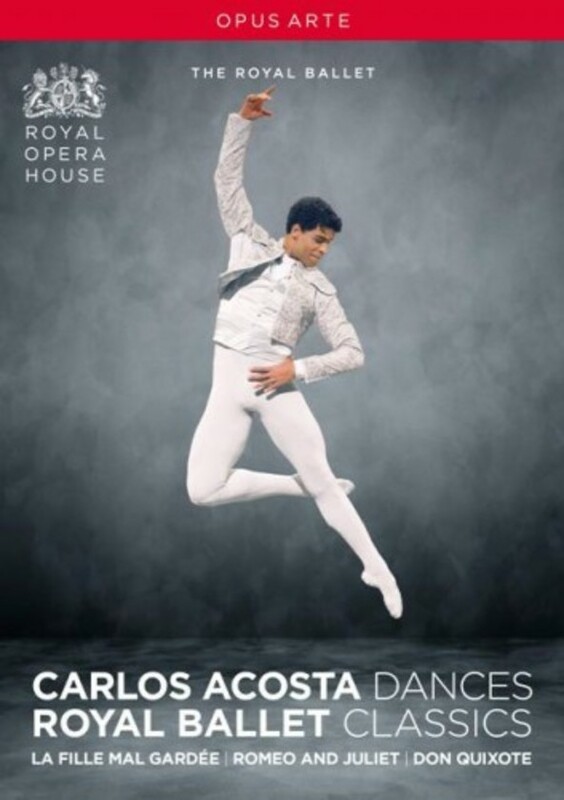 So memorably described as ‘a dancer who slashes across space faster than anyone else, who lacerates the air with shapes so clear and sharp they seem to throw off sparks’ (Independent), Carlos Acosta has been at the forefront of contemporary ballet since his arrival at the Royal Ballet in 1998. Here he sparkles in three of his most celebrated roles: the young lover Colas in the joyfully bucolic La Fille mal gardée, which received five stars from the Guardian, Times and Mail on Sunday; the innocent but doomed Romeo in Prokofiev’s sumptuously-scored adaptation of Shakespeare’s famous play; and, acting as producer and choreographer for the first time, as Basilio in Don Quixote, a production that wowed audiences thanks to its ‘intelligent’ choreography and Acosta’s ‘titanic determination, bullet-proof charisma [and] delectably trusting and playful rapport’ with costar Marianela Núñez (Daily Telegraph). These three compelling ballets showcase Carlos Acosta’s world class reputation as a dancer and choreographer, bolstered by outstanding co-stars and artists of the Royal Ballet.